For me the most amazing and exciting thing about travelling is – you can probably guess – food. But it’s not just the food itself that gets me all worked up, it’s also the culture around it. Because if you try to separate the food from the culture, it’s like taking a tree, removing it from its soil and environment, and then planting it somewhere else – it’s probably still going to grow, but not in the same way. Sometimes separation can result in entirely new cultures around the food. Sometimes it’s nice to not just appropriate the food but also parts of the culture. Wouldn’t it be nice to have a Swedish fika at least once during a regular working day? Wouldn’t you love to regularly fika? Now what is Swedish fika you may ask. Or perhaps you already know. The word itself, both used as a noun and a verb, is actually a development from the 19th century slang for coffee – in Swedish kaffe, but at that time called kaffi. I’m sure you will have spotted it already, in this back slang where syllables were reversed, kaffi became (f)fika. It is a slang which may have actually developed as a kind of code for people who couldn’t go without their coffee at a time when this highly popular drink was banned – precisely because it was so in demand. When coffee arrived in Sweden in 1685, it quickly upset other import businesses due to its popularity. So that people who wanted to drink it, had to do so secretly. Fika, in an older meaning of the word also means “to strive (for).” It’s a nice way to remember then, that when you’re yearning for a fika, you’re striving for a coffee, or rather for a coffee break, traditionally with added sweets, usually baked goods such as cinnamon rolls. But in many offices in Sweden no striving for is required. 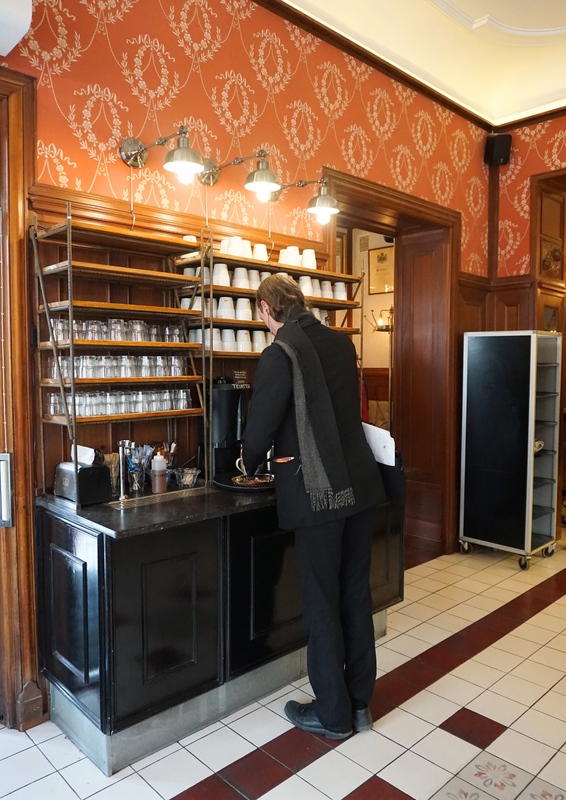 As Richard Tellström has written in Culinary Cultures of Europe*: “the coffee break, or what is called fika, is an institution in Sweden.” It is practically part of everyday life. We went to see friends in Uppsala and spent time with their family too. It was a friend of the family who introduced me to the concept of fika, describing it as a sacrosanct ritual. Every morning, and every afternoon, fika is a must at the workplace. Co-workers bring in baked treats, have their coffee or tea, and engage in conversation. It’s not only a scheduled break, but a time to bond and socialize as well. But fika is not bound to the office. Fika is also had with friends and family. You can invite someone for fika, go to a fika, have a fika outside. And then of course there’s cafés too where you can have a coffee or tea, and some sweets, and call that a fika as well. Because you’re sitting down with friends and having a chat, not rushing out to have your coffee on the go. 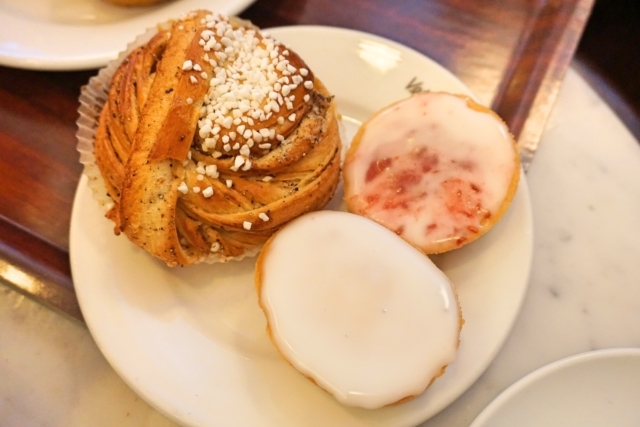 This kind of fika is not dissimilar to the German “Kaffee und Kuchen” (coffee and cake), where cake is replaced for sweets like Kanelbullar (cinnamon buns). Due to women not being allowed in coffee houses when coffee arrived in many parts of Europe during the 17th century, traditions developed where women had their own coffee meetings at home, adding baked goods and other homemade treats. “Kaffee und Kuchen” is one such development which is now still enjoyed by families in Germany, particularly on Sundays, but also in cafés. Fika is another, which developed from the so-called kafferep during the 1900s, where traditionally women would bake no fewer (considered cheap) and no more (considered extravagant) than seven kinds of cookies to have with their coffee. 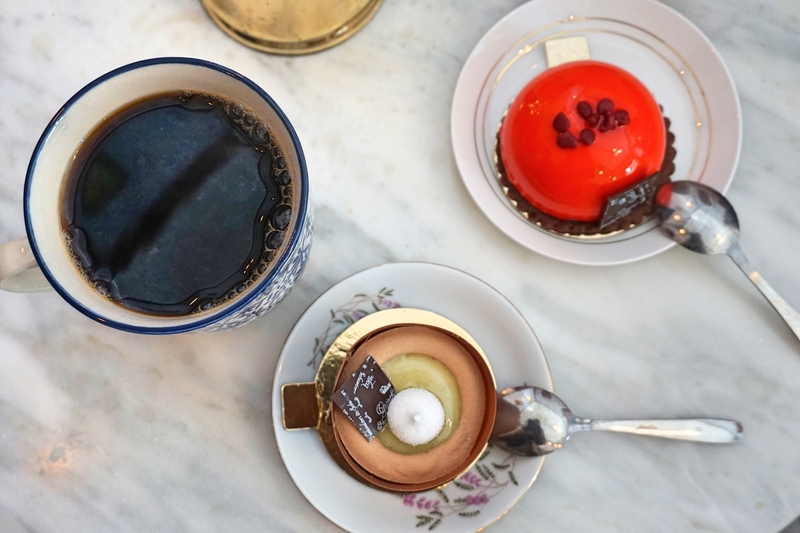 Similarly, the Swedish fika can be compared to the British afternoon tea, which is not just about the food and drink, but about taking the time to enjoy it. Afternoon tea, however, has become more of a thing to do on a special occasion, particularly in London where prices have rocketed to the sky. It is often a much more elegant and formal occasion, including savoury finger sandwiches, scones and many pastries as well. To the contrary, in Sweden fika is a rather frequent occurrence – although we were there for only a week we had three! To be fair, I did specifically ask for one of them – after all, the more foods and traditions I can try, the more I can share with you. It was during our day visiting Stockholm, that our Swedish friend suggested we try a very well established and relaxed place to have fika called Vete-Katten. The largest and oldest Konditori (patisserie) in Sweden, you can truly get lost in the building, and in the smell of history. 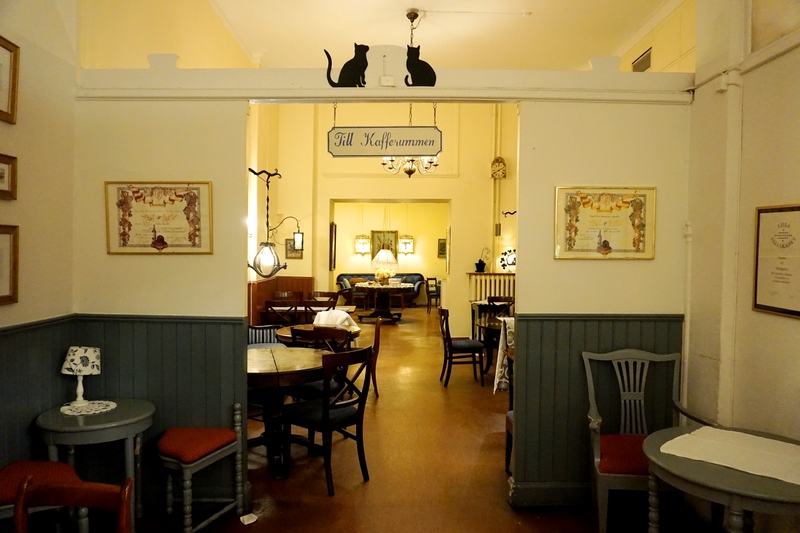 Opened in 1928 by a woman called Ester Nordhammar, who employed only young women in the business until she died in 1961, it has remained a haven of coffee rooms, allowing you to take a moment’s respite from the fast pace of life. It is said the name Vete-Katten, translated literally as wheat cat, came about when Ms. Nordhammar answered to the question what her bakery would be called: “Ja, det vete katten,” translating to “the cat knows,” an expression similar to the English “God only knows” (or for example in German, “the vulture only knows”). I realize this is of no significance whatsoever, but little stories like these always brighten my day. In my time in Sweden, I have noticed Swedes seem to have an affinity for perfumed teas. They also use tea leaves widely, be this at home or in cafés. When the tea is served, the tea leaves end up in a teabag – one that is large enough and of a high enough quality to allow the tea leaves to breathe. 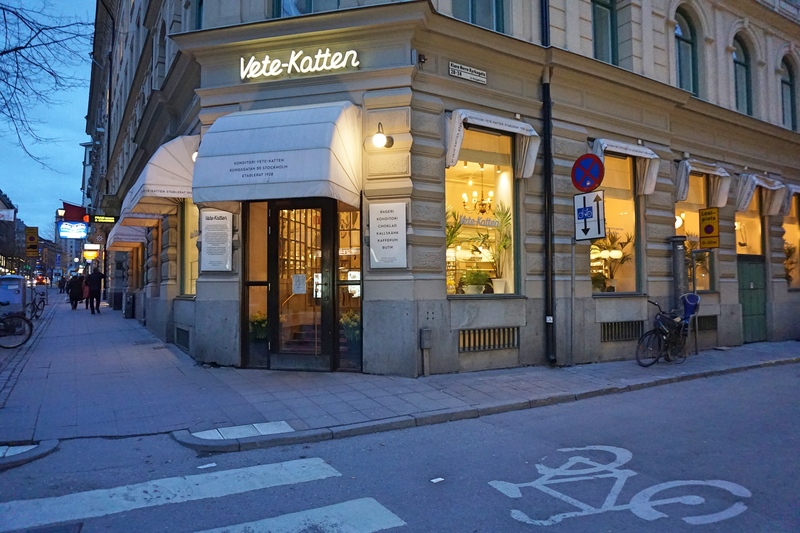 At Vete-Katten, I was of course inclined to try their recommended signature blend, a black tea blend with vanilla, cinnamon and Seville orange. It was a pleasingly smooth and flavoursome tea which went seamlessly well with our other fika items. Although the little chocolate cake we had was not my cup of tea, I can recommend the cardamom and butter bun any day. It was fresh, delicious, just on the right side of sweet – and those cardamom notes coming through made it quite special. Aside from this Kardemummabulle, you will be sure to find other bullar (plural for bun), such as vanilla, pistachio, or cinnamon as well. The cinnamon version, called Kanelbulle, has become so intrinsic to Swedish food culture, that in 1999 the Swedish Home Baking Council decided to fix a National Cinnamon Bun Day (Kanelbullens dag on 4th October). 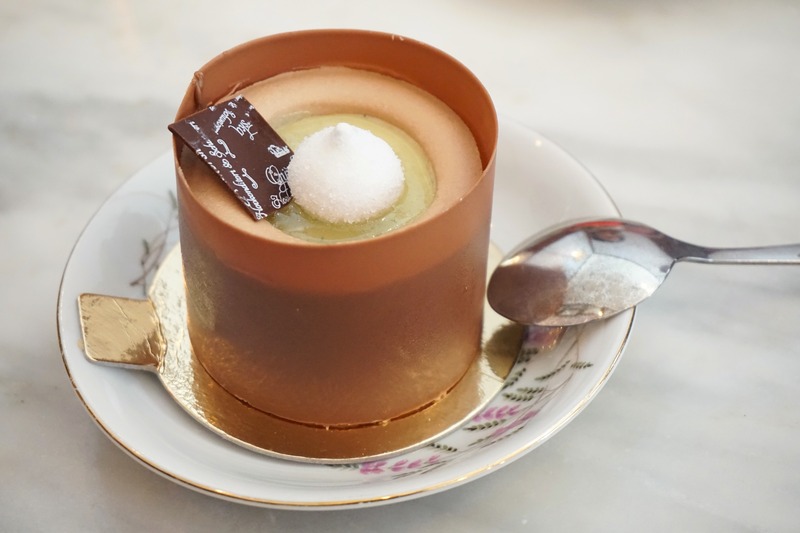 If you’re looking for another new flavour at Vete-Katten, be sure to try the Mazarin as well, a butter and almond pastry topped with a thin layer icing. You can choose from a plain one and one with raspberries, which I’d love to have again right about now. The filtered coffee my friends enjoyed, which you could fill in yourself at the coffee and water station (a common sight in Swedish cafés), was of a high standard as well. It is said that the real secret to why coffee tastes so good in Sweden and other Scandinavian countries, is the cleanness of the water, giving the coffee a special soft taste (if you explore tryswedish.com, a website all about Swedish food culture, you will find this and other valuable information). 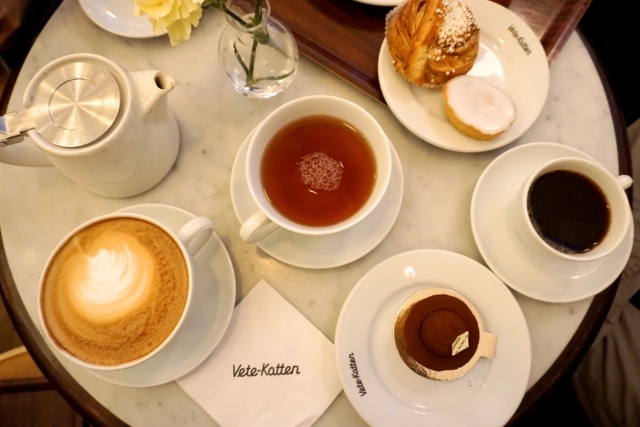 On that weekday afternoon at Vete-Katten, not long before closing time on a cold Spring day, we had the lovely space at the front almost all to ourselves – a great fika way to end a busy day. The second time we enjoyed fika was actually a small family gathering on Easter Sunday, mixing local cultures with foreign traditions: we had a lamb-shaped Easter cake as many families would have in Germany on the day. But for a final fika experience, we enjoyed coffee, tea, and sweets at patisserie Güntherska in Uppsala (established in 1887), another historic yet cosy looking place, where nothing felt rushed, and everyone seemed to embrace slow life, making the time to take a break and savour the moment and enjoy the communal nature of fika. There I decided to try an unblended Chinese Keemun black tea. Again, I was very pleased with the quality. It was a tea that worked well both with or without milk, and its slightly bitter taste complemented the sweet treats perfectly. Amongst these, everyone’s favourite was the flashy red Hallondröm, a raspberry vanilla yoghurt mousse. Because the fruity flavour was the dominant one in this dessert, I preferred the Pär, an almond chocolate pear mousse. It was actually a goodbye-fika we had with our friends. What a nice way to end our trip to Sweden. *Tellström, R. 2005. “Sweden: From crispbread to ciabatta” in Culinary Cultures of Europe: Identity, Diversity and Dialogue (ed. D. Goldstein and K. Merkle). Strasbourg: Council of Europe Publishing, p.428.